Yes, another virus post so soon – but totally worth it! This paper  published in Nature Nanotech is an epic example of coupling between several cutting edge technologies to produce something truly incredible that pushes back the boundaries of what we believe is possible. As awesome as that is, it does mean that the details of the experiment are a little ….’complex’…. (i.e. not even I fully understand them!) but the implications remain the same regardless. First off the paper title: “Detecting single viruses and nanoparticles using whispering gallery microlasers”. The first and last bits are simple enough, the group, from Washington University, use a tiny laser to detect virus particles and nanoparticles. That’s pretty impressive alone, as the particles they detect are between 20 and 60 nanometers in diameter, that’s 100 000 000 times smaller than you or I, 1000 times smaller than most human cells, and STILL 50 times smaller than most bacteria. Looking at it another way these things are only 100 times larger than INDIVIDUAL ATOMS. So yeah, they’re quite small really, and in most cases would be virtually impossible to detect. But now onto the cool stuff, how they actually detect them. Here’s the problem with objects that small, they are smaller than the wavelength of light in most lasers. What does that mean? Well, you can think of it like the laser acts like the nanoparticles are not there at all, they’re simply too small to effect it – which is really bad when you’re trying to use that laser to detect those particles! So what this group did, is to use whispering gallery modes to ‘focus’ the laser light, allowing them to detect the effects of the particles. Whispering gallery modes are actually relatively simple to visualize, as long as you don’t start thinking about them too much! (then they start to blow you mind if you’re anything like me!) Their names come from famous architectural structures around the world, like St. Paul’s cathedral in London, whose acoustics do weird things to sound waves. Specifically the round structure of the domes in these buildings allow whispered conversations held on one side of the room to be heard clearly by people at other places in the room but not everywhere else. There are little ‘loud patches’, where the sound waves are focused, depending on where the sound emanated from and the acoustics of the building itself – hence the name ‘whispering galleries’. So that’s the story for sound, but it turns out that as light is a wave, you can do the same thing to focus light, but as the wavelength of light is much smaller you don’t need an entire building to do it in! In fact, all you need is a little spherical shape of a dense, transparent material – like silica (Silicon Dioxide) for instance. Shining a laser onto these little shapes traps the laser light inside them, using the total internal reflection phenomena that makes fibre optic cables possible and leaves you with an enclosed beam of light that can interferes with itself at certain locations to give bright and dark patches (like the loud and soft patches with sound) depending on the shape and the surrounding material. And HERE is the cool bit: because of the wave nature of light, the laser is sensitive to a very small distance outside of its prison (due to evanescent waves and quantum physics if you’re interested! ), and THIS is what they use to detect those nanoparticles. 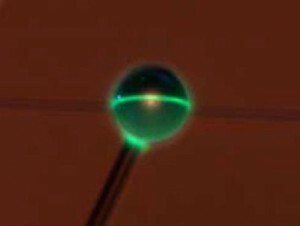 When nanoparticles are close enough to the edge of the spheres, they alter the frequency of the laser ever-so-slightly allowing them to be detected by comparing different parts of the laser and adding their frequencies together. The presence of a nanoparticle makes the addition of the frequencies generate a ‘beat frequency‘ (this is what you hear when someone tunes a violin, playing two similar noted makes their combined sound ‘beat’ unless they are perfectly in tune, in fact the closer they are to being perfectly matched, the worse the beating effect making this method of detection highly sensitive!). Experimental set up showing the laser an nanoparticles (left), and the output and beat frequency (right) - from Reference 1. This allowed the group to reproducible detect 30 nm diameter polystyrene nanoparticles, 10 nm gold particles, and the coup de grÃ¢ce: detection of 60 nm Influenza A virions (i.e. individual virus particles). This level of highly accurate, real-time detection is one of only a few techniques in the world capable of this level of accuracy and speed, and using such a beautiful, complex system to do it is a testament to human ingenuity and perseverance. Also it’s awesome, just in case that wasn’t clear from my earlier description! I really look forward to each edition of Nature Nanotech – it’s like Christmas for nerdy people!